The Apple EarPods have been three years in the making but was it worth it? While it was the iPhone 5 itself, along with iOS 6, a new version of iTunes and the new iPod touch that made headlines, Apple also made a few, somewhat smaller waves when it unveiled its new EarPods earphones. The first thing that you'll notice about the EarPods is that they look notably different to Apple's previous earphones. Rather than the usual circular design of earbuds, these have been designed to fit "the geometry of the ear". The friendly, rounded design gives them a bit of a spaceage look, while Apple has retained its trademark white finish. There's no denying that the EarPods feel more stable than the old earphones, but they still don't feel as snug as in-ear buds such as those that come with the Samsung Galaxy Note. While we were wearing them, we constantly felt as though they could fall out at any moment. To their credit, they didn't actually fall out, but we still couldn't shake the feeling that a sudden head movement would've dislodged them. While they may feel a little unstable, they're certainly not uncomfortable - unlike the oddly shaped earphones that are provided with the Nokia 808 Pureview which are about as uncomfortable as it's possible for a pair of earbuds to be. The carry case is a nice thought, but one that's likely to be abandoned the first time you try and get the little blighters back into the box. It's a fiddly process and one that we suspect will be swiftly ditched by those without the dexterity of a brain surgeon. Without the protective case, the EarPods will probably last about as long as any other similarly priced earbuds when they've been wrapped around your iDevice and stuffed into your bag (which is to say, not very long). According to Apple: "The audio quality is so superior, they rival high-end headphones that cost hundreds of pounds more". Hmmm, we reckon that might be stretching it a bit but they're certainly a massive improvement. Apple has clearly taken a few tips from the likes of Beats by Dre when it comes to the low end response, with the EarPods offering up a far meatier bass performance than their predecessors. Overall sounds quality is just about as good as the earphones that come with the likes of the Samsung Galaxy Note and far better than the tinny earphones that come with some of HTC's phones. However, the EarPods simply can't compete when set against rivals of the same price. Shelling out just ten quid more will get you the Sennheiser CX495 or the Sony XBA2 earphones - both of which offer superior sonics as well as better noise isolation. That's one area where Apple has made big improvements. 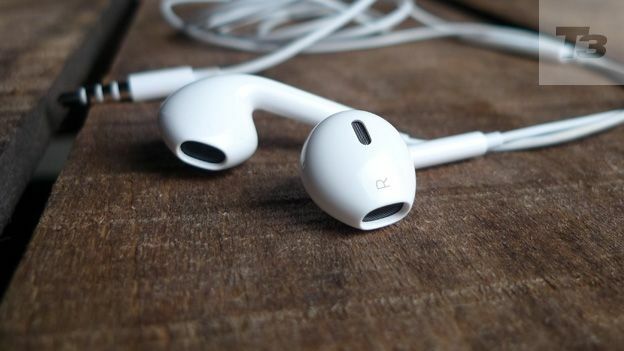 While it was possible to hear exactly what someone was listening to at a distance of 50 paces with the old earphones (we exaggerate, of course), the EarPods channel far more of the sound towards your ears. Which is nice. Especially for your fellow commuters. As far as Apple audio goes, the EarPods are certainly a welcome improvement. There's no way that we would've recommended using the Cupertino brand's previous earbuds, but the EarPods do the trick if you don't want to splash out on a new pair, having just spent all your wedge on a shiny new iPhone 5. However, if you're considering buying the EarPods as a standalone product, they're hard to recommend at 25 notes - we reckon your money is probably better spent elsewhere.